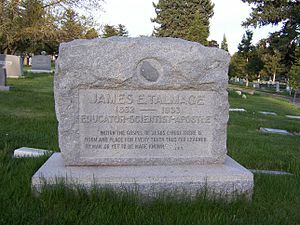 James Edward Talmage (21 September 1862 – 27 July 1933) was an English chemist, geologist, and religious leader who served as a member of the Quorum of the Twelve Apostles of The Church of Jesus Christ of Latter-day Saints (LDS Church) from 1911 until his death. Talmage was born and raised in Hungerford, Berkshire, England on September 21, 1862. He was baptized into the LDS Church at age 10 on 15 June 1873. He moved with his family to Provo, Utah Territory, in 1876. In Provo, he studied the Normal Course at Brigham Young Academy (BYA), with Karl G. Maeser as one of his teachers; he graduated in 1880. In 1881, Talmage received a collegiate diploma from BYA's Scientific Department, the first such diploma to be issued. His early predilection was for the sciences, and in 1882 and 1883 he took selected courses in chemistry and geology at Lehigh University in Bethlehem, Pennsylvania. Talmage was not a contender for a degree at Lehigh University, yet during his one year there he was able to pass almost every examination that a four-year course required. He graduated and in 1883 started advanced work at Johns Hopkins University in Baltimore, Maryland. Talmage served on the Provo City Council in 1888 and 1889. Talmage married Merry May Booth (1868–1944) on 14 June 1888. Booth was a native of Alpine, Utah, and the daughter of immigrants from Lancashire. She started studies at the normal school connected with BYA in 1885, when she was 16. It was there she met Talmage, who was one of her instructors. While at BYA, Booth was secretary of the Polysophical Society. After completing her course of normal study, May took a job as a teacher in Kaysville, Utah. A few months later, Talmage undertook a project to study the waters of the Great Salt Lake; Talmage's main reason for this journey, though, was to pursue a relationship with Booth, and five months later they were married. The Talmages had eight children. Among their children was John Talmage, who wrote a biography of his father. Another of their children, Sterling B. Talmage (1889–1956), followed his father's interests and became a geologist. Talmage studied chemistry and geology at Lehigh University and Johns Hopkins University. He received a B.S. degree from Lehigh University in 1891 and a Ph.D. from Illinois Wesleyan University for nonresident work in 1896. In the spring of 1884, while at Johns Hopkins, Talmage journaled about laboratory experiments involving the ingestion of hashish, reporting that interviews with users conducted by himself and two colleagues yielded very different accounts of the experience. Talmage noted that the ill effects of opium were very unpleasant and had been well-documented, "[b]ut the ill effects are reported very low in the Haschich or Hemp administration; and we have concluded to try effect of a small dose upon ourselves ... though I very much dislike the idea of doing such a thing, for as yet I have never known what it is to be narcotized either by tobacco, alcohol, or any drug." Thus, on three occasions, 22 March, 5 April, and 6 April 1884, Talmage ingested increasing doses; on the first two occasions he felt no effect, but on the third he reported simply, "[c]ontinued my experiment by taking 20 grains Cannabis Indica and the effect was felt in a not very agreeable way." For many years, Talmage was a Fellow of the following learned societies: the Royal Microscopical Society (London), the Royal Scottish Geographical Society (Edinburgh), the Geological Society (London), the Geological Society of America, the Royal Society of Edinburgh, and the American Association for the Advancement of Science. He was also an Associate of the Philosophical Society of Great Britain, or Victoria Institute. Talmage taught science at BYA both before and after he went to study in the eastern United States. He was the president of Latter-day Saints' University until 1894 and then was president of the University of Deseret from 1894 to 1897. From 1897 to 1907, Talmage was a professor of geology at the University of Utah. In 1909, Talmage was serving as the director of the Deseret Museum. He went to Detroit, Michigan, in November of that year to participate in diggings connected with the Scotford-Soper-Savage relics craze. Talmage would go on to denounce these findings as a forgery in the September 1911 edition of the Deseret Museum Bulletin in an article entitled, "The Michigan Relics: A Story of Forgery and Deception". Talmage's paternal grandfather was the first in his family to join the LDS Church. Even though the church was small and relatively unknown at the time of his birth in 1862, Talmage was born basically as a third-generation member of the church. For various reasons, Talmage was not baptized until he was ten years of age instead of the traditional eight years age, when most Latter-day Saint children are baptized. Before he was baptized, he became seriously ill and his father believed the illness came as a result of him not being baptized at the proper age. Talmage's father made a promise with the Lord that if his son would recover, his father would make sure Talmage was baptized as soon as possible. Talmage recovered and was soon baptized on June 15, 1873. Talmage was the author of several religious books, including The Articles of Faith, The Great Apostasy, The House of the Lord, and Jesus the Christ. These volumes remain in print and are still widely read in the LDS Church. Other books include treatises on the origins of the Book of Mormon, a dictionary of the Book of Mormon, and a brief history of the church. Talmage wrote the book Jesus the Christ by request of the church's First Presidency in 1905. They requested he compile his lectures about the life of Jesus Christ into a book that would be widely available to church members and other readers. At that time, Talmage had many responsibilities with his church callings, his family, and his profession that kept him from starting the book but nearly ten years later, following another request from the First Presidency, he started writing Jesus the Christ. The significance that was placed on the writing of this book about the life of Christ is seen in the First Presidency's setting aside space in the Salt Lake Temple as an area for Talmage to work on the book uninterrupted and without distractions. After completing the manuscript, Talmage wrote about the experience in his journal saying, “Had it not been that I was privileged to do this work in the Temple it would be at present far from completion.” Jesus the Christ was published in September 1915, just under one year after Talmage started writing it. In 1911, the First Presidency learned that a man named Max Florence, a former theater owner in Salt Lake City, had gained unauthorized access to the Salt Lake Temple. He had taken numerous photographs of the interior and was holding those photographs for ransom, but the church president at that time, Joseph F. Smith, would not negotiate with Florence on the subject. Florence said that he would sell the pictures to anyone who named a high enough price. A few days after this news was publicized, Talmage suggested to the First Presidency that they commission their own photographs of the Salt Lake Temple and publicize them as a book of photos. Smith authorized Talmage to get the pictures and also write on the subject of the temple to accompany the publication of the photographs. The House of the Lord was completed and published shortly thereafter in 1912. Before he became a member of the Quorum of the Twelve Apostles, Talmage was an alternate high councilor in the Utah Stake of Zion. He became a member of the Quorum of the Twelve Apostles on December 7, 1911 after Charles W. Penrose, a member of the Quorum of the Twelve up until that time, was appointed as second counselor in the First Presidency. Additionally, from 1924 to 1928, Talmage served as president of the church's European Mission. Talmage was an attentive student and teacher of science, but this did not conflict with his religious views or beliefs. He did not believe there was conflict between science and religion and did not worry about differences or discrepancies between the two fields of thought. He believed that with time and continued learning, these discrepancies would eventually be resolved. He had confidence in the scientific method and was able to accept scientific discoveries and findings supported by it while still holding fast to his religious beliefs. His views on science and religion are demonstrated by this statement: "Within the Gospel of Jesus Christ there is room for every truth thus far learned by man, or yet to be made known." Talmage's views on science and religion can also be seen through an event that took place in 1929. In that year, B.H. Roberts, a scientific scholar and LDS Church leader, presented a 700-page manuscript to the First Presidency which attempted to completely align theology and science. Other church leaders were concerned with what was written in this manuscript and disagreed with the claims about evolution represented. Joseph Fielding Smith, then a member of the Quorum of the Twelve Apostles, made a statement against what was written about evolution in the manuscript prepared by Roberts. At that point, Talmage got involved to try and mediate between the two points of view and suggested to the First Presidency that they come out with a statement of neutrality on the issue, which they did. They soon came out with a statement stating that neither side of the argument was accepted as church doctrine. Almost immediately after his return to Provo, Utah after his schooling in the East, Talmage was asked to run for the office of Territorial Superintendent of Schools by the People's Party. While he expressed appreciation for the honor, he could not accept due to his recent appointment as the first counselor in the presidency of Brigham Young Academy, additionally, he was ineligible to run for office since he was not a United States citizen. Soon, he applied for citizenship and received his naturalization papers and although he was not one to be actively involved in politics unless necessary, Talmage went on to serve on the Provo City Council, as alderman, and as justice of the peace. Talmage died on July 27, 1933 in Salt Lake City at age 70. He was buried at Salt Lake City Cemetery. The vacancy in the Quorum of the Twelve created by his death was filled by Charles Albert Callis. The Mathematics and Computer Sciences Building at Brigham Young University is named after Talmage. The University of Utah College of Science is housed in the James E. Talmage Building. ^ Talmage, John R. (1972). The Talmage Story. Salt Lake City, Utah: Bookcraft Inc. pp. 1–10. ^ Talmage, John R. (1972). The Talmage Story. Salt Lake City, Utah: Bookcraft Inc. p. 12. ^ a b Jensen, Andrew (1920). Latter-day Saint Biographical Encyclopedia. vol. 3. Salt Lake City, Utah: The Andrew Jensen History Company. p. 788. ^ Provo Municipal Council. "Provo City Code - Historical Data" (PDF). Provo City. Retrieved 22 March 2016. ^ Talmage, John R. (1972). The Talmage Story. Salt Lake City, Utah: Bookcraft Inc. p. 73. ^ Biography of Merry May Booth Talmage from the BYU Register of the BYU Special Collections collection of the M. M. B. Talmage papers. ^ Talmage, John R. (1972). The Talmage Story. Salt Lake City, Utah: Bookcraft Inc. pp. 68–69. ^ Sterling B. Talmage Papers Archived 19 January 2008 at the Wayback Machine. ^ Andrew Jenson. Latter-day Saint Biographical Encyclopedia, vol. 3, p. 787. ^ a b c Rowley, Dennis. "Inner Dialogue: James Talmage's Choice of Science as a Career, 1876–1884", Dialogue: A Journal of Mormon Thought 17(2): 112–30 (Summer 1984). ^ University of Utah Alumni Association e-newsletter, U-News & Views, August 2007. ^ Richard B. Stamps, "Tools Leave Marks: Material Analysis of the Scotford-Soper-Savage Michigan Relics", BYU Studies, vol. 40 (2001) no. 3, p. 212. ^ Talmage, John R. (1972). The Talmage Story. Salt Lake City, Utah: Bookcraft Inc. pp. 3–4. ^ a b Reynolds, Elise (14 September 2015). "Jesus the Christ: The Story behind the Story". history.lds.org. Retrieved 24 September 2018. ^ "Set in Stone, Fixed in Glass – Epilogue: The Max Florence Affair". signaturebookslibrary.org. Retrieved 2018-09-24. ^ Kent Walgren, "Inside the Salt Lake Temple: Gisbert Bossard's 1911 Photographs," Dialogue: A Journal of Mormon Thought 29:1–43 (Fall 1996). ^ David R. Seely, "Explaining the Temple to the World: James E. Talmage's Monumental Book, The House of the Lord", FARMS Review 12(2):415–26 (2000). ^ Jensen, Andrew (1920). Latter-day Saint Biographical Encyclopedia. Salt Lake City, Utah: The Andrew Jensen History Company. p. 787. ^ Garr et al., Encyclopedia of Latter-day Saint History, p. 1217. ^ Talmage, John R. (1972). The Talmage Story. Salt Lake City, Utah: Bookcraft Inc. pp. 231–233. ^ a b "The Search for Harmony". signaturebookslibrary.org. Retrieved 2018-09-26. ^ Talmage, John R. (1972). The Talmage Story. Salt Lake City, Utah: Bookcraft Inc. pp. 56–57. ^ Jensen, Andrew (1920). Latter-day Saint Biographical Encyclopedia. vol. 3. Salt Lake City, Utah: The Andrew Jensen History Company. p. 788. ^ Jensen, Andrew (1936). L.D.S. Biographical Encyclopedia. 4. Salt Lake City, Utah: The Andrew Jensen Memorial Association. p. 320.